I’ve recently returned from a 10-day trip to Italy, seven days of which I spent cycling around Puglia. Although it’s quickly becoming a more popular part of the country to visit, Puglia still doesn’t see anywhere the number of tourists that regions like Veneto, Lombardy, Tuscany or Lazio do. And that’s one of the things I loved about visiting: there is very little traffic on the roads (perfect when you’re not an experienced cyclist), life moves at a much slower pace here, and everything just feels more Italian. Puglia is located in the heel of Italy (if you picture the country as a boot; see the picture below). It stretches from Monte Gargano in the north to Santa Maria di Leuca in the south, and is home to around four million people. The region covers a massive 19,345 square kilometres and boasts 860 kilometres of stunning coastline. You’ll also find an abundance of charming ancient towns, beautiful Baroque architecture, extravagant churches, and millions upon millions of olive trees and prickly pears covering Puglia’s largely rural landscapes. 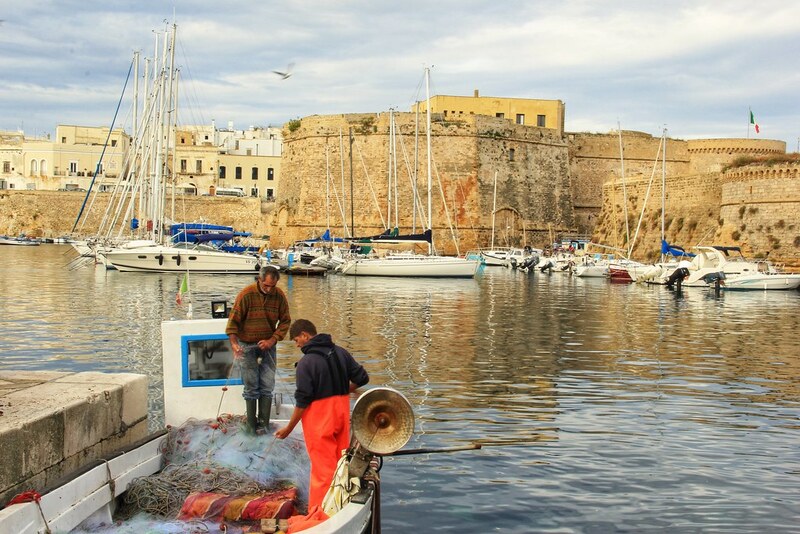 Puglia is served by two international airports – Bari in the north and Brindisi in the south. Bari is the bigger of the two and therefore offers a more frequent flight schedule and slightly cheaper flights, but budget airlines Ryanair and Easyjet operate flights in and out of both. We flew from London Stansted into Bari (as we were starting or trip in Matera) and out of Brindisi (as it’s slightly closer to Lecce – where we finished our trip). You can check prices and availability on Skyscanner here. In hindsight I probably would have chosen to travel a little further and fly home from Bari, because in all honesty Brindisi was a little underwhelming, and in comparison I’ve heard that Bari is actually quite a nice city. That said, our accommodation in Brindisi was literally steps from the train station, which is where the bus departed from to make the 30-minute journey to the airport. So, it did make getting home an absolute breeze. We paid £79.54 per person altogether for our flights there and back. We hired our 27-gear road bikes (along with maps and route notes) through local agent Girolibero. 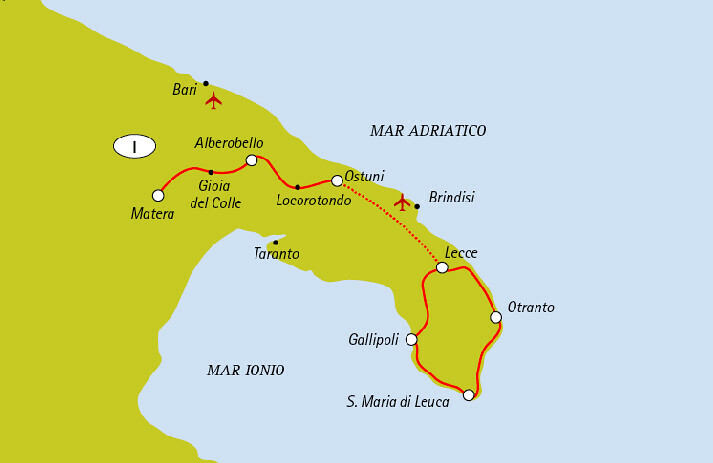 They run a number of self-guided cycling tours in Italy and other European countries. We’ve used them previously to travel along the coast from Venice to Porec in northern Croatia, and found them to be professional and well-organised. We love the freedom and flexibility that self-guided tours offer over those where you’re allocated a guide. As long as we got from point A to point B in a single day, the route we took in order to do so, and the places we stopped at along the way, were entirely our own decisions to make. Whilst it is possible to get around Puglia by public transport, I’d highly recommend hiring a car or hopping on a bicycle – like we did. If you decide upon the latter, it’s useful to know that this part of Italy is mostly flat (with a few gentle undulations/slow and steady hill climbs) and that 99% of the time you’ll be cycling on tarmac. We completed an average daily distance of 55 kilometres (not accounting for a few occasions we got lost). We actually spent three nights in Matera, but as this post is a Puglia travel itinerary (and Matera is actually in Basilicata), I’ll be writing all about Matera in a separate post. I’ll let you into a little secret though: I fell so hard for Matera. It’s an absolutely unmissable destination if you’re in this part of Italy. Rather than easing us into the whole cycling thing, day one of our itinerary saw us covering the the greatest daily distance of the trip. Obviously – because we had a lot of ground to cover – we couldn’t find either of the landmarks mentioned at the start of our route notes (I believe the water fountain in Piazza Veneto di Vittorio was in the process of being renovated when we visited and the building we suspected was once the cinema had been repurposed), and subsequently cycled around Matera in circles for a good half an hour before returning to the road that we had originally routed for. And then we stopped at the sculpture park on the outskirts of the city. 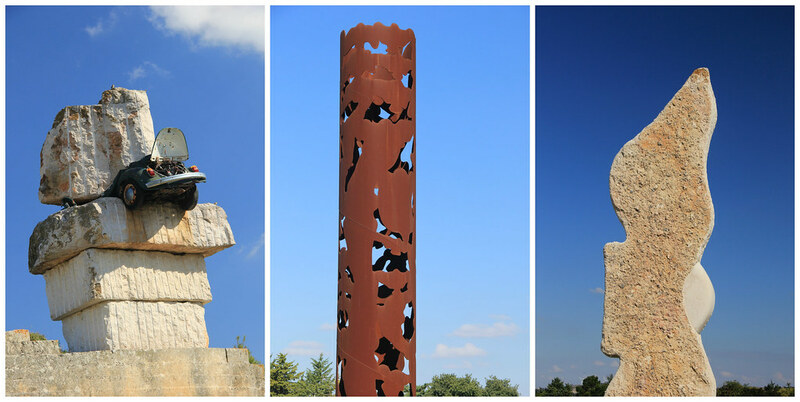 The brainchild of sculptor Antonio Paradiso, Parco Scultura La Palomba is now a permanent feature within this spent tuff quarry. It’s also a great place for spotting lizards. The next place I’d recommend stopping at on route to Alberobello is Gioia Del Colle, a small town on the Murge Plateau with an impressive 12th century Byzantine fortress at its core. Gioia Del Colle is also famous for its fior di latte mozzarella – made from cow’s milk rather than buffalo’s. 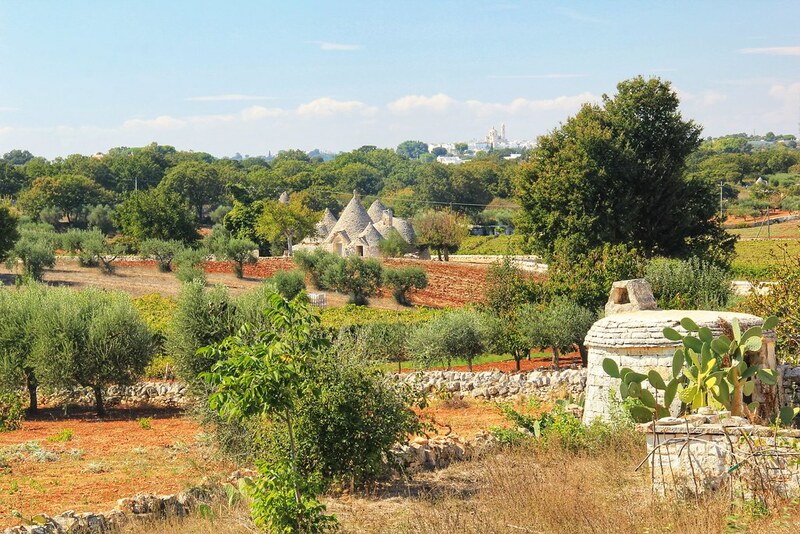 From Gioia del Colle, we continued on through Le Murge Plateau – an ancient karst plateau abundant in diverse natural habitats – and then, around two thirds of the way to Alberobello, we spotted our first Trulli houses. And every new sighting from that point onwards saw us leaping off our bikes and reaching for our cameras. Trulli (plural of ‘Trullo’) are conical dry-stone structures that date back to the 16th century, and are unique to this region of Italy. Back in the days of the Middle Age Feudal System, peasants were instructed to build their homes without mortar, so that – should there be a royal inspection – the structures could be easily dismantled, so that the ruling lords could avoid paying taxes to the King. Ironically many of them are still standing today – centuries after their initial construction. 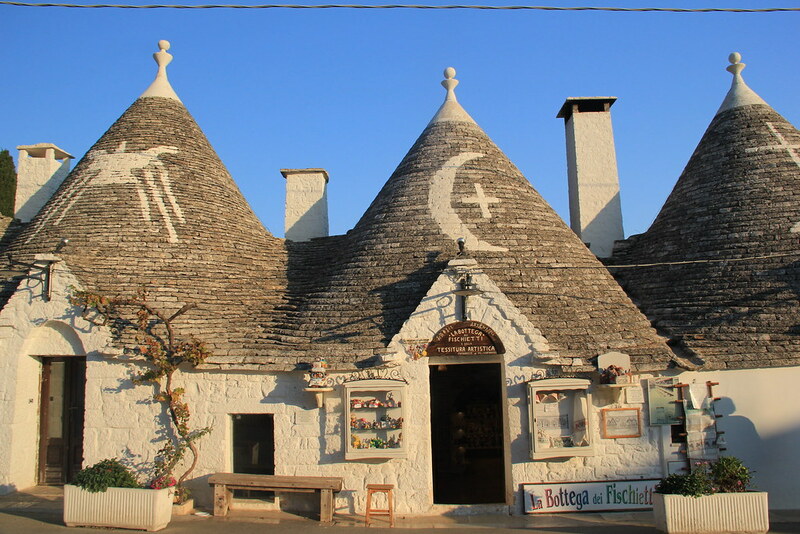 Although the largest concentration and best preserved examples can be found in Alberobello, you’ll find clusters of Trulli all over Puglia. They’re one of the features that make the landscape so unique. Unfortunately we didn’t arrive into Alberobello until around 5:30pm, so by the time we’d showered and changed the sun had set over this unique little town whose streets were still crawling with tourists at a time when we thought all the day trippers would have gone home. When we wandered into town later that evening to find something to eat, we soon discovered the reason why Alberobello was ridiculously (and, we assumed, abnormally for this time of day) busy – we had managed to serendipitously time our visit with the town’s annual light festival. After being turned away from the first (and only!) three restaurants on our list, we stumbled upon Il Guercio. We had a short wait for a table (around 10 minutes), which we spent enjoying a glass of wine at the bar and salivating over exactly what we were going to order off the menu. It’s always a bad idea to wait until you’re ravenous (we’d eaten nothing since breakfast and had cycled 75 kilometres!) because you want to order EVERYTHING! 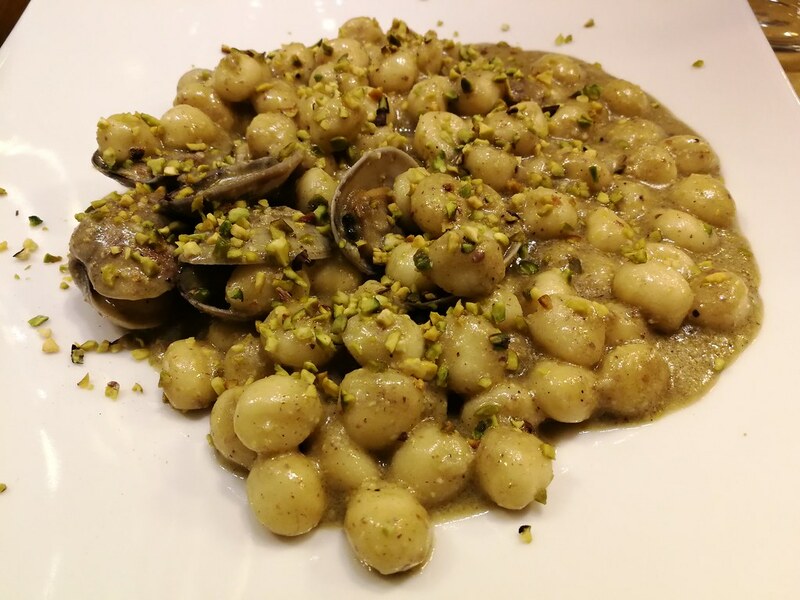 I must admit, I was defeated by the cheeseboard but the gnocchi with clams in a pesto and lime sauce topped with crushed pistachios was nothing short of amazing; there was no way I was leaving any of that. 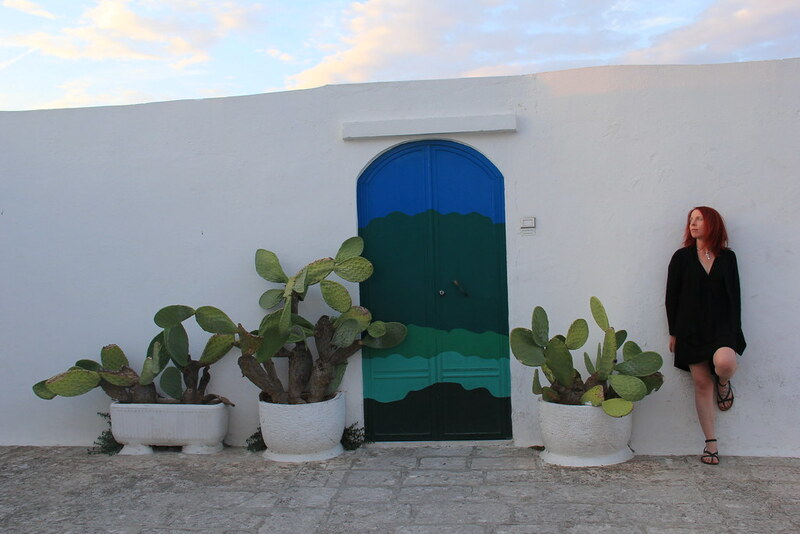 Where we stayed in Alberobello: In an actual Trullo! (part of the Trullidea complex). 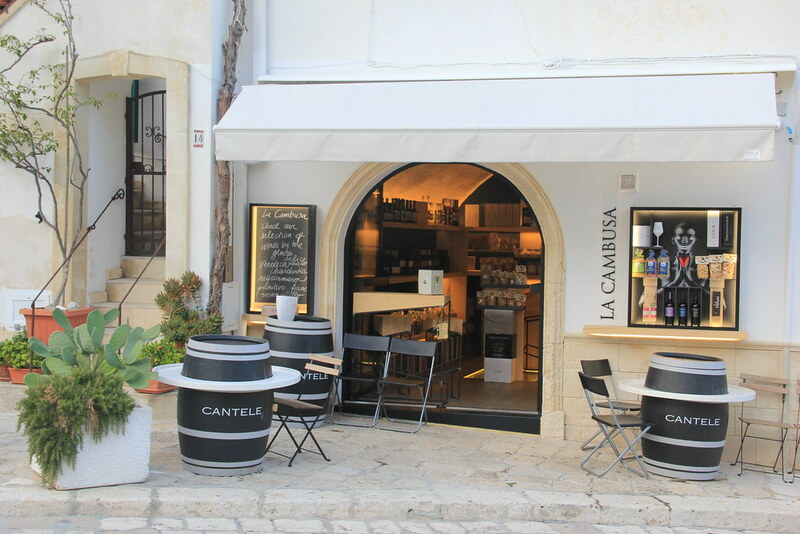 Our Trullo was located just around the corner from the main Trullidea building that houses their reception, bar and breakfast area, and smack bang in the middle of the Rione Monte quarter – within the Trulli Zone. As I’d not really had much opportunity to explore Alberobello the day before, I decided to set my alarm for 6:30 this morning in order to have a wander around the town’s Trulli Zone before breakfast. Although the dawn light was not great for taking photographs, the streets were delightfully quiet – as I’d hoped they would be. Apart from a couple of Asian girls who were also out taking photographs, a few local residents who were busy setting up shop for the day, and an affectionate little tortoiseshell cat, I had the entire place to myself. After breakfast it was back on the saddle again in the direction of Ostuni. 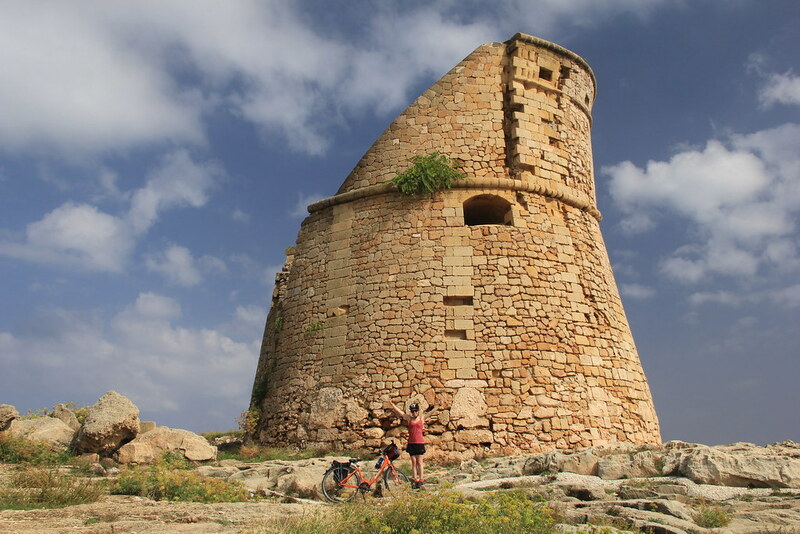 We continued to ride through landscapes of of agricultural land and olives groves punctuated with clusters of Trulli – some of which appeared to be residential and others that had been left derelict, possibly used for storage. 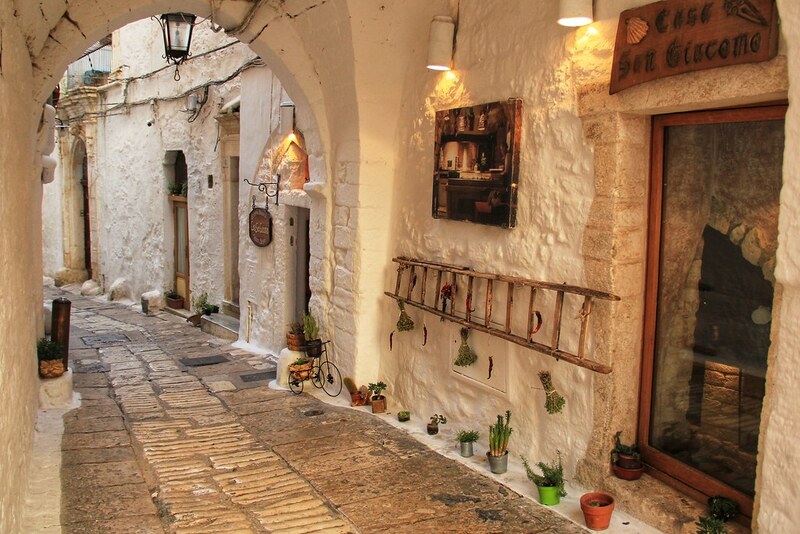 The one place you absolutely should not miss between Alberobello and Ostuni is the sleepy little village of Locorotondo. Meaning “round place” due to the circular structure of its historical centre, Locorotondo is perched on a hilltop on the Murge Plateau and is widely recognised as one of the most beautiful villages in Italy. There’s not a lot going on here and there are no notable sights or attractions, but this is a large part of Locorotondo’s appeal. So, park up, take a wander through its delightfully charming streets, browse its inviting little shops, or simply grab a table in the sunshine at one of its impossibly cute street-side restaurants. 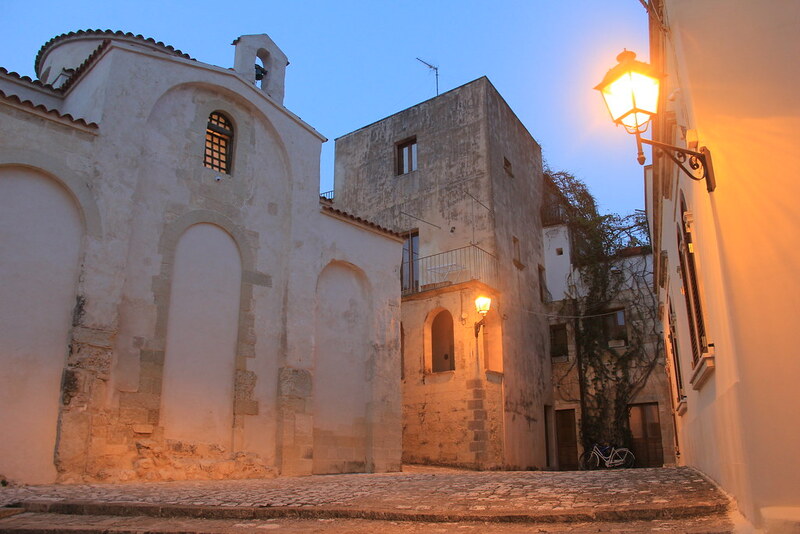 I guarantee you that a few hours in Locorotondo will be time well spent. 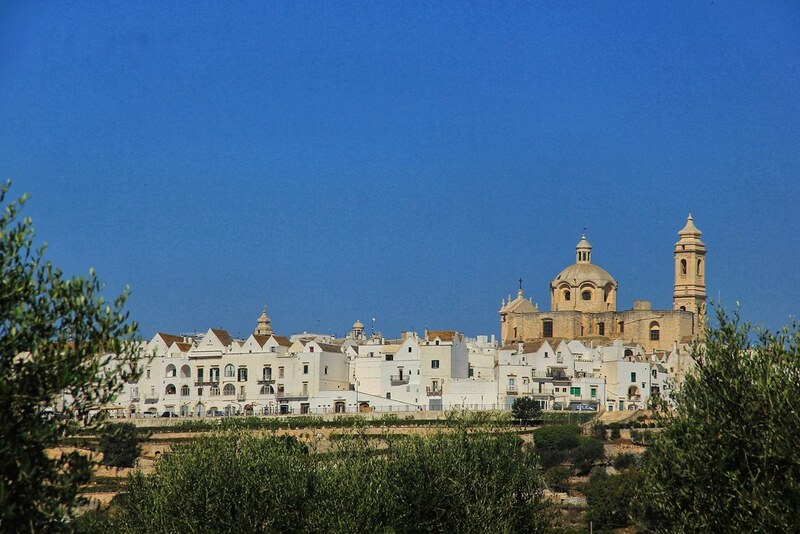 We also wanted to take the small diversion to Martina Franca (whose picturesque historic centre is reportedly a maze of whitewashed simplicity contrasted with Baroque extravagance), but – given the time we had available and the distance we had to travel – we’d had to make a choice. And Locorotondo won. We arrived into our final destination at around 4pm (a great view of the Ostuni and the surrounding countryside can be admired from the Hotel Incanto, as you approach the walled city), so we had plenty of time to wander around and snap a few photographs before the sun set. 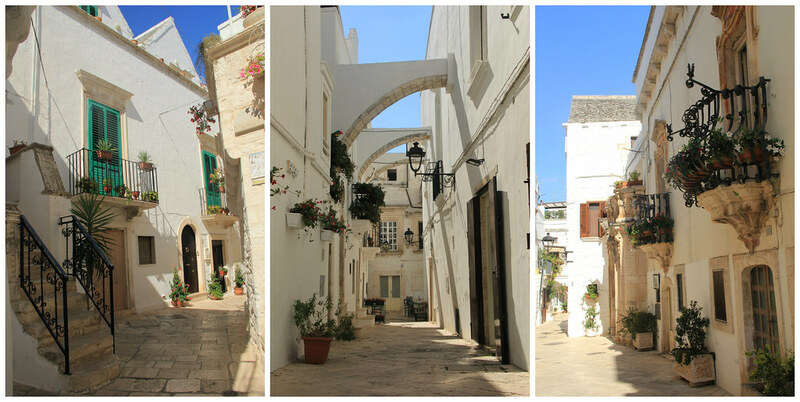 I actually really loved Ostuni. 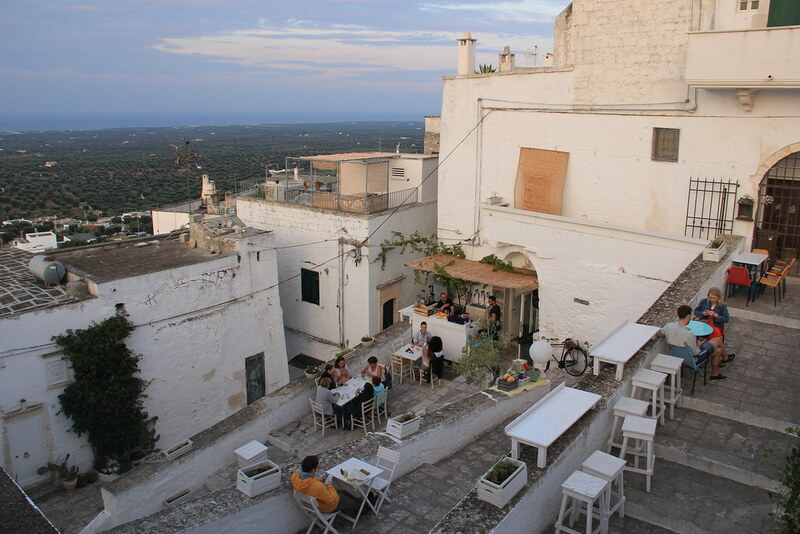 Not only does its location – perched atop a hill – afford it some spectacular views of the beautiful Valle d’Itria in every direction, but its whitewashed old town (which has resulted in Ostuni being known as the ‘Citta Bianca’ (‘The White City’)) with its tangle of medieval cobbled streets lined with well preserved ancient buildings is an absolute delight to wander around – especially during those couple of hours before darkness falls. 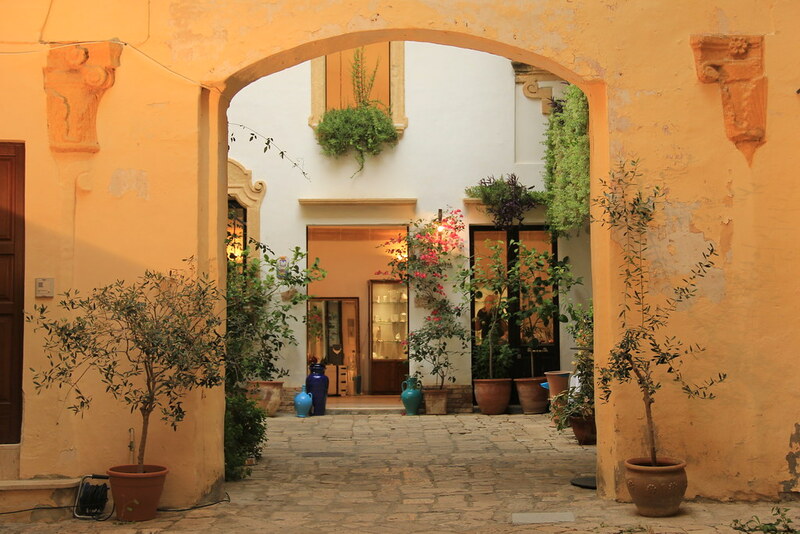 Where we stayed in Ostuni: Hotel La Terra. We couldn’t have asked for a better location right in the centre of the old city. 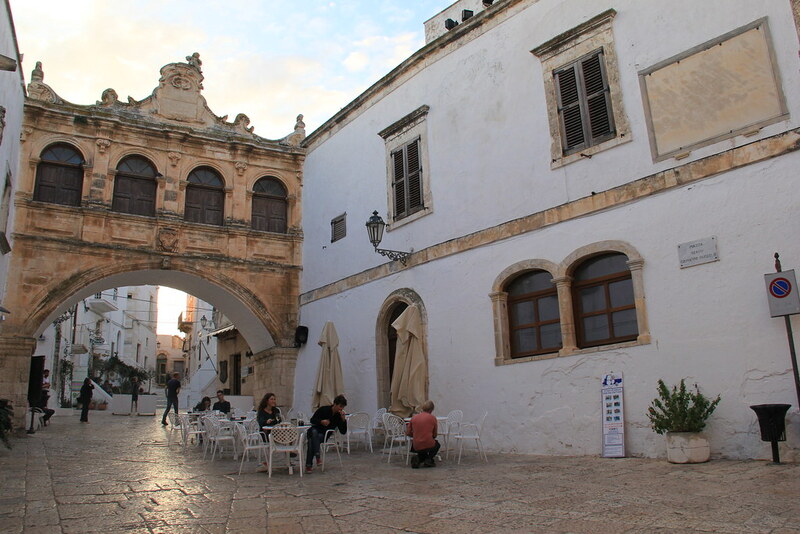 The hotel is a restored 13th century building with some wonderful features and decor, its rooms offer views across the Citta Bianca, and the inclusive breakfast was one of the best we ate in Puglia. Whilst we’d been lucky with the weather thus far (always a bit of a gamble when you visit in the off-season; we were there at the beginning of October), the forecast for today was scattered thunderstorms. We just had to hope that they’d decide to scatter somewhere other than where we were cycling! We made it down to Ostuni’s railway station without getting rained on, but almost as soon as we’d boarded the train to Lecce (from where we’d begin our ride today), the heavens opened. And I mean PROPERLY opened! Fortunately for us though, the rain had stopped and the sunshine had come out by the time we arrived in Lecce. But the rain was never far away, and our waterproof jackets were always close to hand. However, for the most part of our ride through the Salento plains and towards the Ionian coastline, we managed to stay dry. We’d hoped to make a stop in Nardo (a town that’s reportedly home to the most beautiful Baroque square in southern Italy) but an incident involving my mobile phone and a banana (top tip: don’t leave a banana in your handlebar bag with your camera and mobile phone when you’re travelling over poorly-surfaced, bumpy roads; a cereal bar is a much safer snack option) delayed us somewhat. So we continued on to our final destination for the day – Gallipoli. Gallipoli – meaning “beautiful city” in Greek – really does live up to its name. 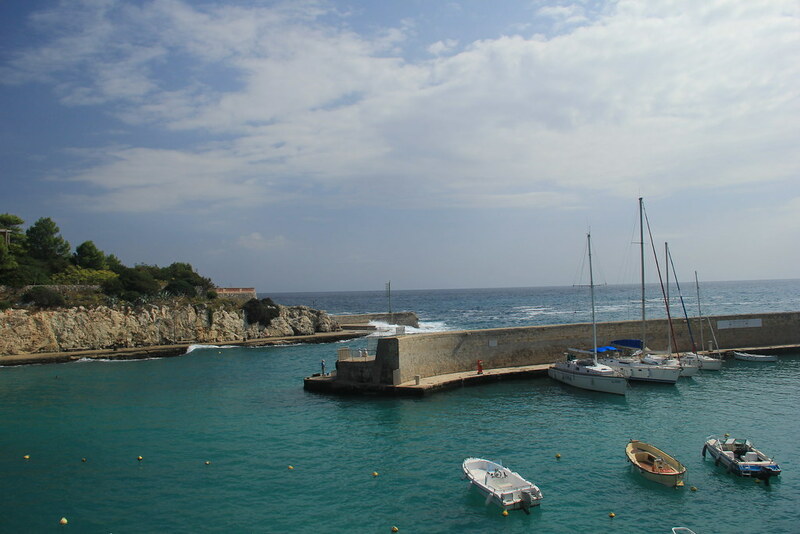 Its historic centre is located on a limestone island, accessible only via sea or a 16th century bridge, and is surrounded by the remains of its 14th century fortified walls. Its narrow lanes – barely wide enough to accommodate a Fiat 500 – are lined with ancient buildings and beautiful Baroque architecture. At dusk, the whole place just feels so damn atmospheric. Where we stayed in Gallipoli: Hotel 33 Baroni. I loved the panoramic breakfast terrace (although the sea view is somewhat obscured) and the fact that there is a heated towel rail in the bathroom – an absolute Godsend when you’re cycling through thunderstorms! It’s around a 10-minute walk from the hotel over to Gallipoli’s historic centre, but you’ll pay a much higher price to stay on the opposite side of the Ponte Città Vecchia (old city bridge). As we cycled away from Gallipoli’s harbour, catching glimpses of the fishermen repairing their nets following their early morning haul, the skies above us were still looking incredibly ominous. We’d had one hell of a storm overnight (rumbles of thunder had awoken us from our sleep) and puddles of water lay in random patches on the cobbled streets below us. Our route today saw us hugging the coastline of the Gulf of Taranto, passing several cute little seaside towns – which would have been wonderful places to stop at, had the weather been cooperating. 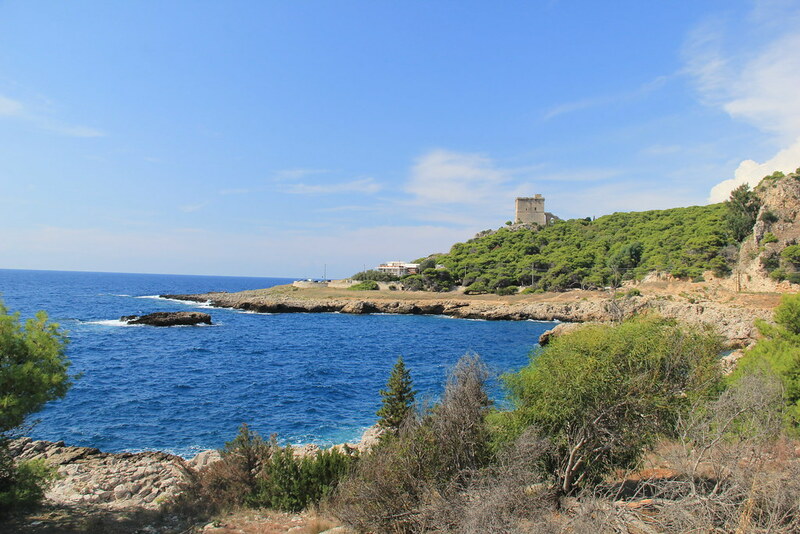 Instead we cycled past empty beaches and closed beachside cafes on to Santa Maria di Leuca. Sitting on the southernmost tip of the Salento peninsula, Leuca (as it’s more commonly known) boasts a pretty stunning location on a promontory between the Ioanian and Adriatic seas. 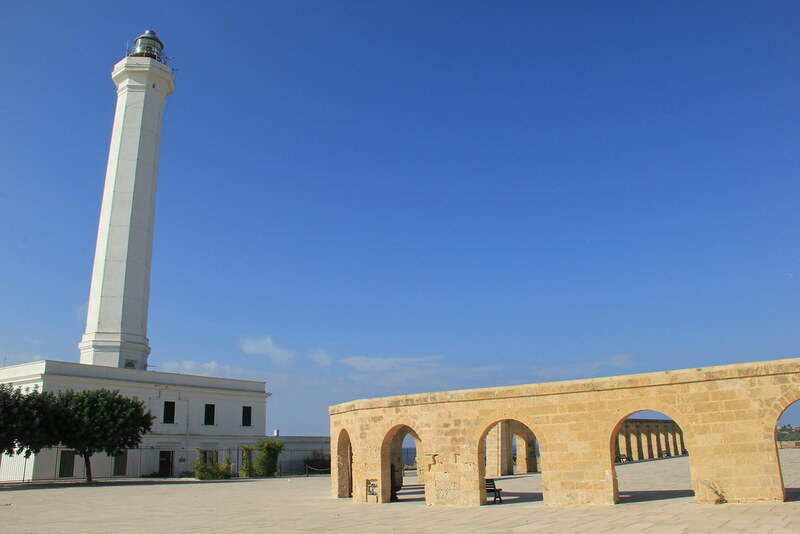 One of the most iconic landmarks in Leuca is its lighthouse, which was built in 1864 on the site of an old 16th century watchtower. It stands 47 metres tall, 100 metres above sea level, and is still in operation today. The only thing I didn’t really like about Leuca was that it’s quite spread out: the harbour is located at one end of town, with the Sanctuario di Leuca and the lighthouse a kilometre uphill from there, and then the main concentration of cafes and restaurants are situated almost a kilometre in the opposite direction. Where we stayed in Santa Maria di Leuca: Hotel L’Approdo. Designed in a typical Mediterranean style and situated in a panoramic position overlooking Leuca’s harbour, family-run Hotel L’Approdo was another of my favourite hotels in Puglia. There’s a reading corner inside, and a small shop selling unique and handcrafted items of clothing, scarves and wall-hangings, and outside there’s an amazing terrace and pool with sea views. I couldn’t believe the change in the weather when I glanced out of our window before breakfast. The heavy rain and wind that had made our venture into town to find somewhere to eat for dinner a somewhat miserable experience had disappeared to reveal blue skies and sunshine. 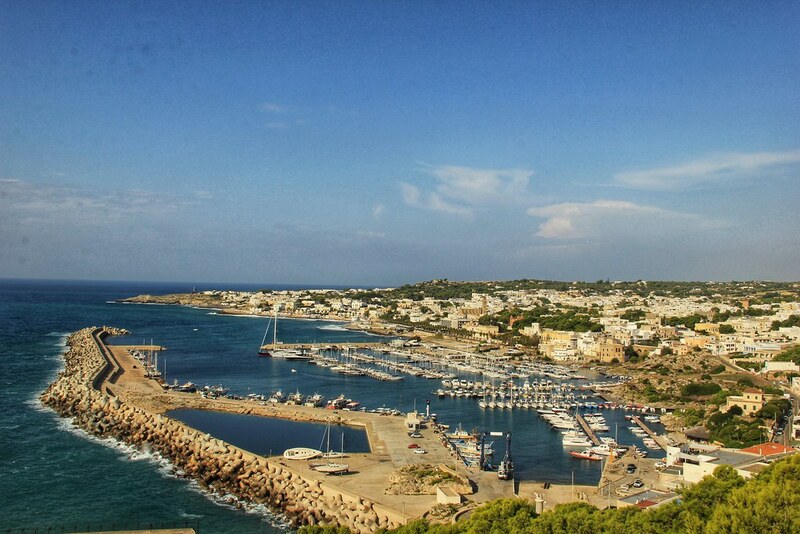 But before we left Santa Maria di Leuca, we got to admire the town from above; our route took us steeply uphill from our hotel, towards the famous lighthouse. Whilst I do think that’s a bit of a sweeping statement to make (and cannot possibly be accurate unless the writer travelled everywhere, along every coastal road), the scenery we witnessed today was definitely the most spectacular of the whole 7-day trip. 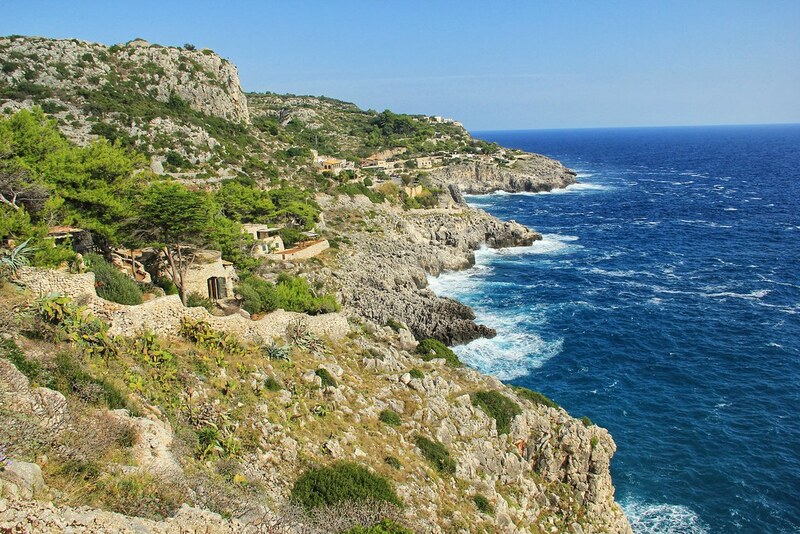 Almost the entire stretch of road (at least as far as Punta Palascìa) traverses the Regional Nature Park of the Otranto Coast, where you’ll find hidden inlets, fishing hamlets, pine forests, olive groves, ancient towers, and caves accessible only by sea. Our first stop was Ciolo – or rather the 25-metre-high bridge that marks your arrival into Ciolo. 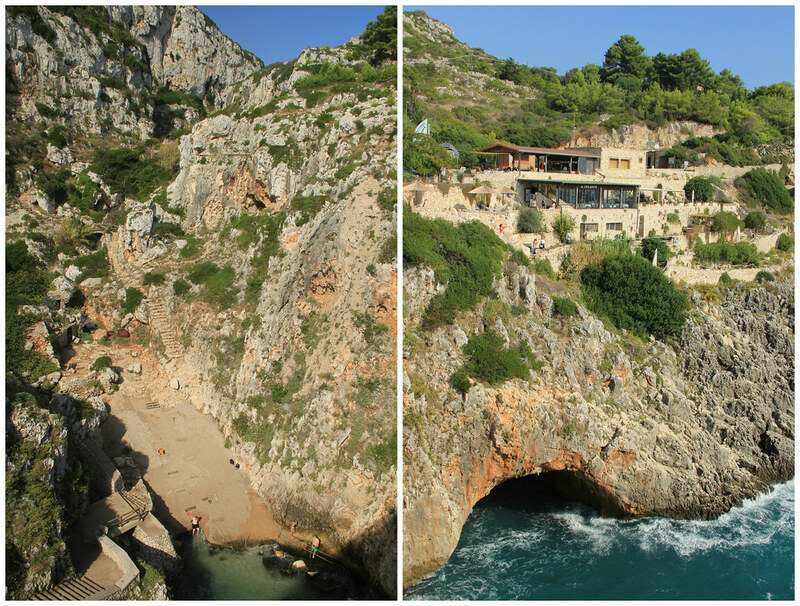 The bridge crosses a deep ravine that leads directly into the sea, forming a small, sheltered cove where it’s possible to swim. We also took a short coffee break further along the road at Tricase Porto, a small natural inlet that has, over time, become the town’s marina. The views might not have been quite so dramatic as those at Ciolo, but it was a peaceful spot from which to enjoy our mid-morning caffeine hit. One of our best finds along the second half of the route was this incredible Saracen Tower. Saracen Towers were constructed in the 16th century by order of Emporer Charles V. They were built in strategic positions (each one close enough that it could communicate with the tower at either side of it) along the entire length of the Puglian coastline, in order to protect citizens from constant invasions. Many of them aren’t accessible from the road, but this one was. And it was massive! We arrived into Otranto just in time to catch the exterior of its cathedral bathed in the day’s last few rays of sunlight. For those of you who like your superlatives (like me! 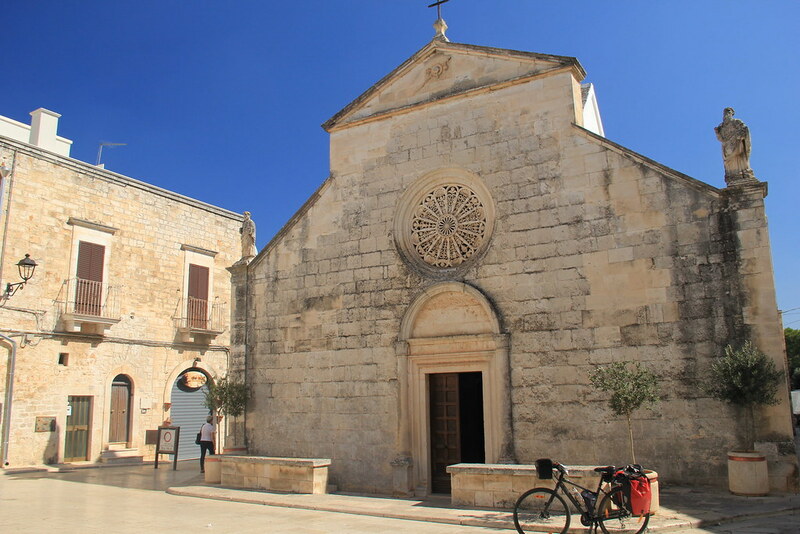 ), you may be interested to know that Otranto is Italy’s easternmost town. Otranto’s imposing castle, thick perimeter walls and robust towers (built after the town was liberated from the Turks in the late 15th century) dominate much of the town, but there’s also an intriguing maze of streets that is fascinating to explore at dusk. Add to this a small port, white sandy beach, a series of seafront promenades and some excellent fish restaurants (the tuna at Il Cantico dei Cantici was some of the best I’ve ever tasted, and cooked to absolute perfection) and you’ve pretty much got a near perfect little coastal town. It’s not as beautiful as Ostuni or as atmospheric as Gallipoli, but it’s a nice all-rounder. Where we stayed in Otranto: Hotel San Giuseppe. We stayed in a lot of amazing old buildings on our trip and this was another: a converted 16th century farmhouse, located within a five-minute walk of the old town and beach. There’s a lovely terrace outside and the buffet breakfast was amazing! For the majority of our trip we’d been relatively lucky with the weather. Although the skies often threatened otherwise, we’d only actually been caught in a couple of brief thunderstorms. That was all about to change on our final day of cycling. A quick check of the weather forecast before we left our hotel confirmed that there was at least a 50% chance of rain at any hour of the day and thunderstorms were likely – which didn’t actually sound too bad, considering that there was also a 50% chance that it wouldn’t rain. Of course, weather forecasters can (and do) get it very wrong, and they did today. 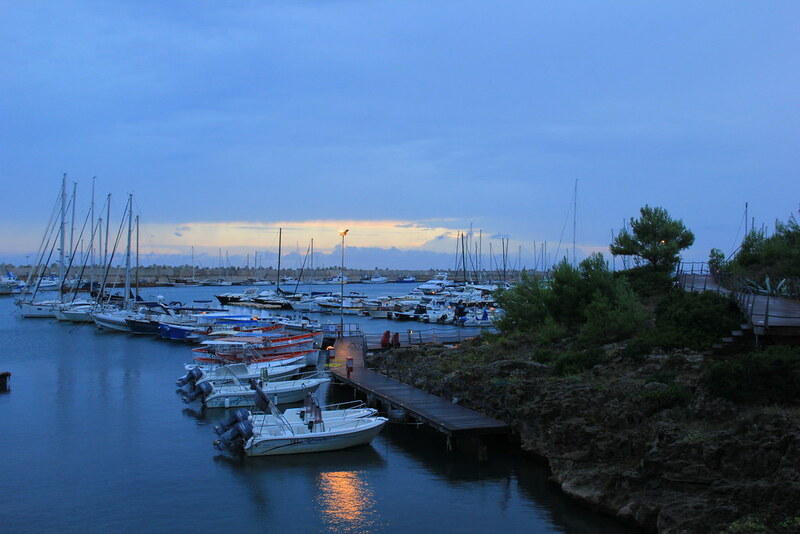 We hadn’t even travelled five kilometres out of Otranto when we heard the rumbles of thunder. The rain followed shortly afterwards – the kind of rain that gets you soaked to the bone within minutes. We were cycling on a main road though; there was nowhere to stop and nowhere to shelter. As soon as we turned off the main road, we pulled over beneath some trees with the intention of waiting for the storm to pass over. It didn’t. We stopped again at Torre Dell’orso to warm up and grab some coffee, and again in the The Cesine Nature Reserve, because it was raining so hard we were struggling to see. We found a little wooden shelter containing a plaque with some information about the area – in Italian. However, even the roof of this structure – which had been designed with the purpose of keeping hikers dry – was letting water through in an increasing number of places the longer we stood beneath it. In the end, with approximately 20 kilometres left to cover, we just decided to go for it. In true Monopoly style: do not pass Go, do not collect $200; just cycle straight to Lecce as quickly and efficiently (i.e don’t get lost) as you can. Of course, we got lost. And we also missed out on a wander around Acaya (which looked like such a pretty little town with an impressive castle) and a swim in the Grotta della Poesia (“Cave of Poetry”). Ironically, by the time we actually arrived at our hotel in Lecce, the rain had (mostly) stopped. 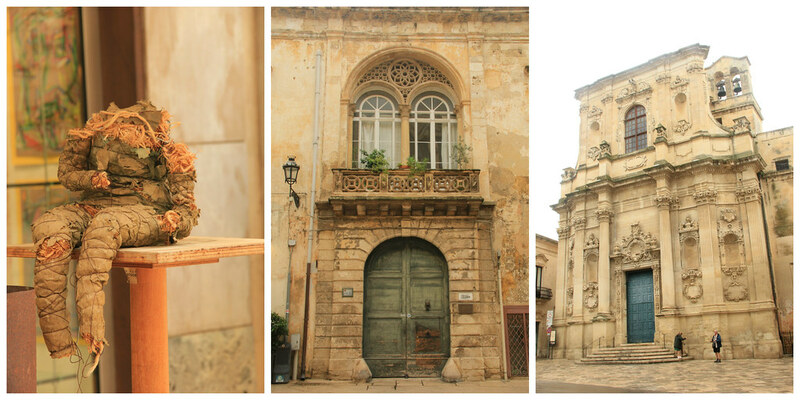 Where we stayed in Lecce: Hotel delle Palme. Bit of an odd hotel this one: the lobby, reception and bar/lounge is very grand with wooden-panelled interior, leather seats and chandeliers, but the rooms have very modern, minimalist interiors. The staff are friendly and helpful, and the service is good, but if you want to stay in the historic centre, you may want to look elsewhere; this one’s a 10-15-minute walk away. Although I probably wouldn’t have minded the walk had it not been chucking it down with rain pretty much the whole time we were there. 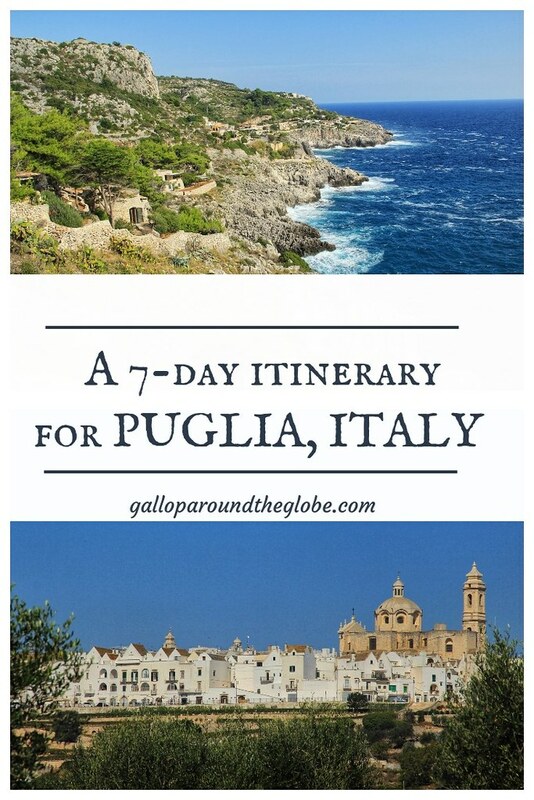 I hope I’ve given you some ideas about what there is to see in Puglia (apart from the town of Alberobello that the region’s most famous for) and exactly how much ground you can cover under your own steam in just seven days. Whilst I’m pleased we were able to experience so many different places, if we visit again I think we’ll choose to make the adventure a little less rushed. 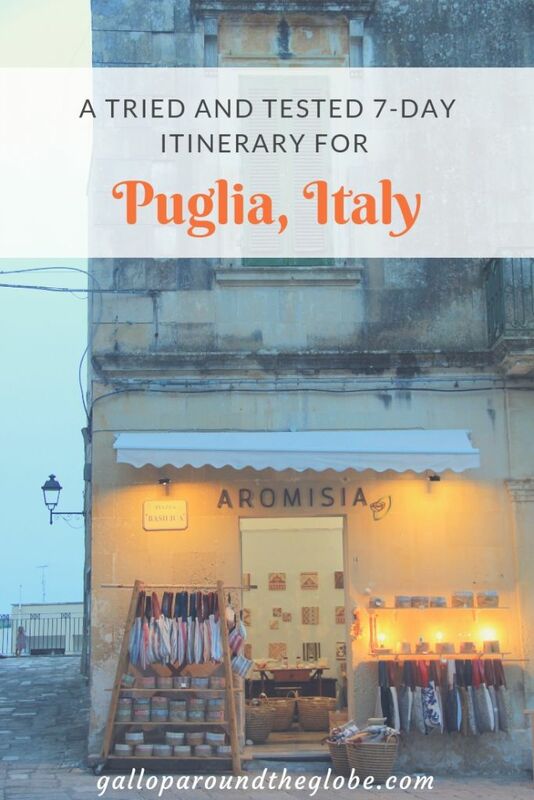 Puglia is a part of Italy that’s made for slow travel and next time I plan to embrace that. 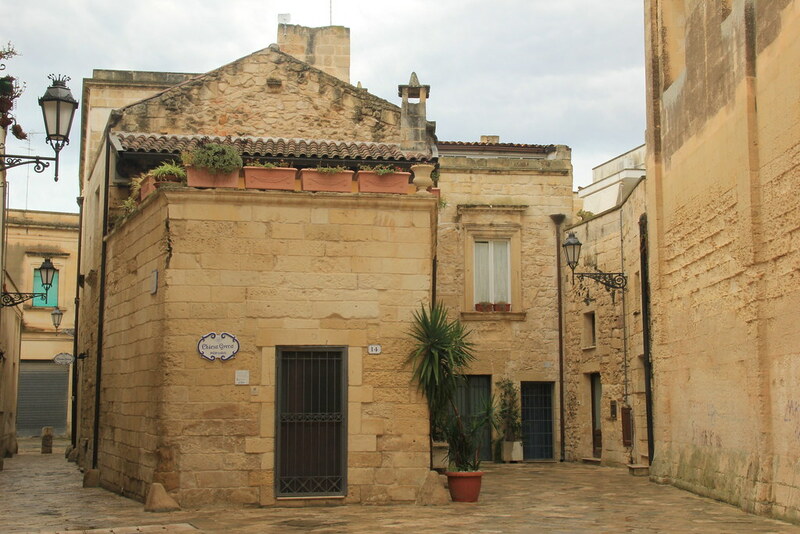 I’d really like to visit Puglia, those houses are so unique to the area. Lovely pictures, you’ve really helped me paint a picture of it. Puglia looks incredible. Yes, it’s not a region you hear of often when people speak of Italy. It doesn’t seem to be as showy as the more popular parts of the country, but there definitely looks to be a subtle beauty about the region. I hope to go one day. Thank you for the lovely photos! Wow! These photos are completely breathtaking and capture this lesser traveled region of Italy. The quaint little cities seem delightful to visit! I am adding this to my travel plans for sure! Thank you so much for this beautiful report, Kiara. It’s one of the best I’ve ever gotten from Tripmasters. I’m an armchair traveler at this stage and it was a pleasure to read and drool over the photos. What is it about the quality of that Italian light? Hi Mary, so glad you enjoyed my Puglia write-up 🙂 If you don’t mind, can I ask where you found my post on Tripmasters?